I love maps. 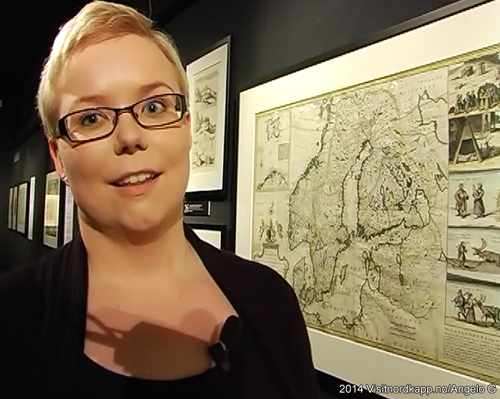 From the summer of 2014 until early 2015, Arktikum had a temporary exhibition of old maps: Mapped Beauty. A collection of maps made between the 16th and the 19th century. According to the rest of the world, the area north of the Arctic Circle was nothing for a long time. It was just wilderness. As people, especially from Europe, started to explore and exploit the rest of the world, it became more important to map it. Mapped Beauty is a fascinating display of the development of both cartography and human dignity. The earlier maps from the 16th century were more wild guesses than accurate disclosures. The sparsely populated area of Sapmi was really off the charts: Inaccurate areas, distances and sites. As time moved along, techniques improved, foreign cartographers got more information third, second and firsthand about the Arctic. In Lapponia 1664 places such as Rovaniemi and Kittilæ were familiar. It is quite fun to see the old maps with the old names. Sometimes they are spelled wrong, translated to another language such as French, or names of places has changed. You had Enarebu, a Swedish village in Inari, Kemi was named Kimi, and Nordkap/mageroya was at the top. Early on, the maps indicated how to get to the different places. It also had drawings and short description of life in the Arctic. And these illustrations are true gems. Early ignorance included sea monsters and a general fear of the unknown. 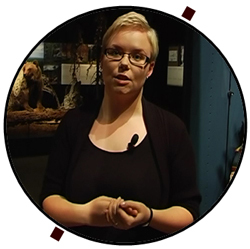 People way below the Arctic Circle did not know much about the Saami people north of it. For dignitaries, the Saami ways were an obstacle to a conquest. 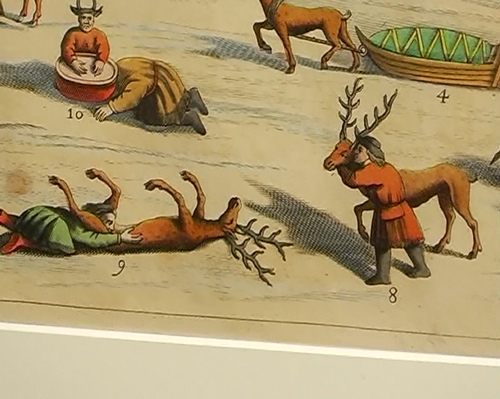 Without the true social context, depicting a reindeer herder castrating a buck by biting its balls made him look like a savage. When the Saami people got better tools it became easier to castrate the bucks. A castrated buck was a better working reindeer, a necessity. It would pull a sled more steadily, for instance. A picture of a bunch of naked people implied human sacrifices. To the European explorers it was a shameful thing to confess a love affair with the Saami. All in all, the native people of the Arctic were not treated with dignity. Dignity has been stowed upon the northerners as late as in our generation. The exhibition moves in two ways. One, the rare maps are beautiful. Two, if you haven’t seen it, locate where it is now, and coordinate your Arctic trip accordingly. When you watch the weather forecast on your national TV, how much of the area north of the Arctic Circle is included?